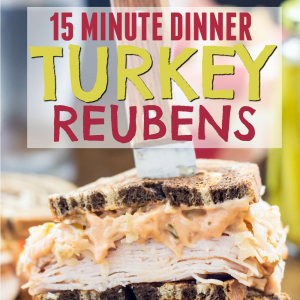 These easy Turkey Reubens are a family favorite and make a great 15-minute dinner! 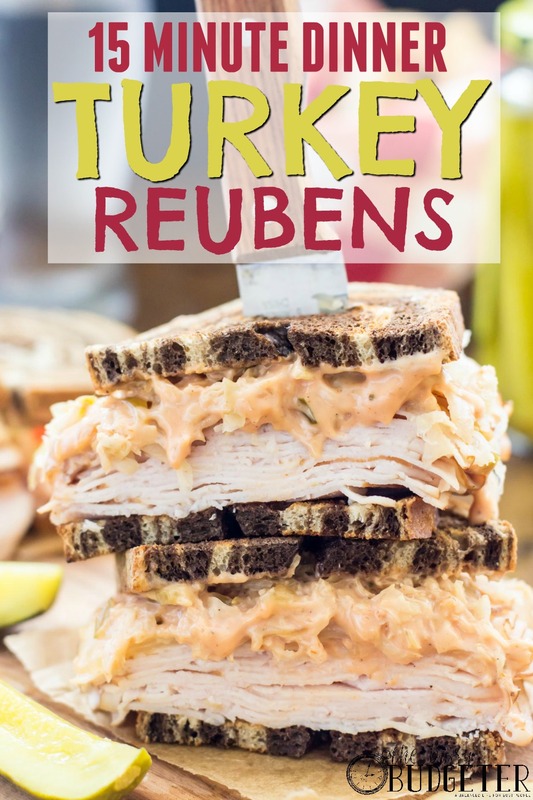 These quick and easy Turkey Reubens don’t even require turning on your stove! Who here loves a good deli-style sandwich? I know I can’t be the only one with my hand raised, right? I used to overlook sandwiches as a good dinner menu item (I once limited them to cold-cuts wrapped in clear wrap and tucked inside lunchboxes), but these turkey reubens have recently become a dinnertime staple in my house. 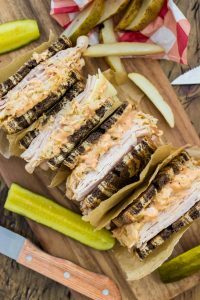 Full of protein and full of flavor, these are some seriously good sandwiches, layered with roasted, deli-sliced turkey, topped with swiss cheese and sauerkraut, and loaded with creamy, homemade thousand island dressing. 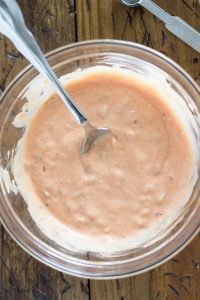 I prefer to make my own Thousand Island dressing because it takes only a few ingredients that I already have in my fridge (rather than buying a bottle). 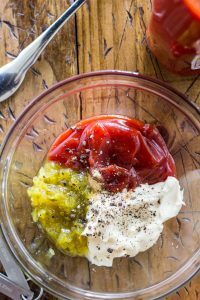 If you don’t have time to make your own, bottled is totally fine, but if you have literally two minutes, just whisk together ketchup, mayo, relish, salt and pepper and you have yourself an easy and homemade sandwich spread. Use a fork to stir everything together until it’s nice and combined. This sauce is good, people! Much better than bottled! I like to use olive oil mayo to save a few calories (and because that’s what I usually keep stocked in my fridge) but regular is fine, too. 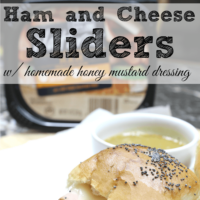 I usually serve these sandwiches with oven-baked home fries, and I love dipping my fries in any extra sauce (so much for saving calories!)! Make sure you slather plenty of sauce onto your (toasted) bread and then assemble your turkey, cheese, and sauerkraut into neat, sandwich-sized portions and heat in the microwave until the cheese is melty and the turkey is heated all the way through. If you feel like you’re cheating for microwaving your reubens, please DON’T! My favorite turkey reuben ever comes from Arby’s, and I know for a fact they make it the same way — turkey, cheese, and sauerkraut are assembled, nuked in the microwave, then placed on toasted rye and slathered with thousand island. Quick, easy, and oh-so-delicious. No stove top or oven required! I'm all about super easy dinner ideas with two toddlers under foot while I cook. 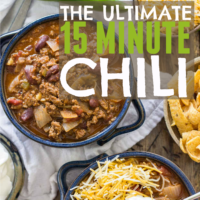 We combine Freezeasy dinners (which I LOVE!) 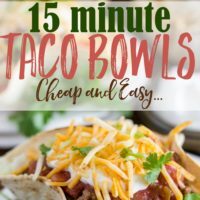 and these super simple 15 minute dinners to get dinner on the table quickly. Dinner stress is almost eliminated now! Prepare dressing by combining ketchup, mayo, relish, pepper, and salt in a medium-sized bowl and stirring until completely combined. Set aside. Divide turkey into four even portions on a large, microwave-safe plate (if your microwave is not very large or your plates too small, you may have to heat the portions just one or two at a time). Top each with a slice of cheese and then evenly divide the sauerkraut over the top of the cheese. 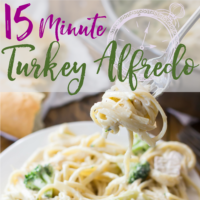 Heat in microwave for 1-2 minutes, until cheese is melted and turkey is hot. Lightly toast bread slices in toaster and then spread one side of each slice with thousand island. Use a spatula to transfer the heated turkey portions on top of a prepared slice of bread. Top with another slice of bread, and then cut in half and serve. Have you made Turkey Reubens before? I’m not usually a turkey sandwich kind of person, but these photos have me nearly drooling on my keyboard! What a great idea for a quick dinner when you’re pressed for time (or even when you’re not!). Sounds delicious! I am glad you shared your recipe!